Shaftesbury is a town in north Dorset situated on the A30, near the Wiltshire border 20 miles west of Salisbury. It is one of the oldest and highest towns in Britain. Shaftesbury - Travel by coach - If you'd like to speak to someone about your journey you can ring Traveline on 0871 200 22 33. Shaftesbury - Travel by road - Shaftesbury is on the A 350. Shaftesbury is about 80 miles from EXETER and about 60 miles from SOUTHAMPTON. Shaftesbury nearby station - Travel by train - Gillingham Station, Station Yard, Gillingham, SP8 4PZ. Ticket office. Waiting room. Refreshment facilities. Pay phone. Toilets. Only parts of station step free access. Taxi rank. Shaftesbury - Sport - Rushmore Park Golf Club, Tollard Royal, Salisbury, Wiltshire, SP5 5PT. Tel: 01725 516326. About 8 miles southeast of Shaftesbury. Shaftesbury - Shopping - Shaftesbury has its market on Thursdays and Saturdays. Its farmers' market is on the first Saturday of the month at the Town Hall, 9am to 1pm. Turnbulls, 9 High Street, Shaftesbury. Tele: 01747 858575. Contemporary yet traditional cafe-deli in the heart of town, with a wonderfully varied menu and delicious delicacies from the delicatessen. Open Mon-Sat 8.45am-5.30pm. Shaftesbury - Entertainment and attractions - Gold Hill was made famous by the Hovis Bread advertisement, with its steep cobbles and picturesque cottages. Shaftesbury - Other information -The town is famous for its ruined Abbey and nearby Wardour Castle. The story of the Abbey is brought to life in a new museum housing a collection of stonework, medieval floor tiles and illustrations from ancient manuscripts. Shaftesbury Abbey Museum & Garden, Park Walk, Shaftesbury, Dorset, SP7 8JR. Tel: 01747 852910. Philipps House & Dinton Park, Dinton, Salisbury, Wiltshire SP3 5HH. Tel: 01722 716663. Shaftesbury is 110 miles from London. It is 60 miles from Lyme Regis to Christchurch and 39 miles from Shaftesbury to Weymouth. Ferry ports indicated are Poole and Weymouth. 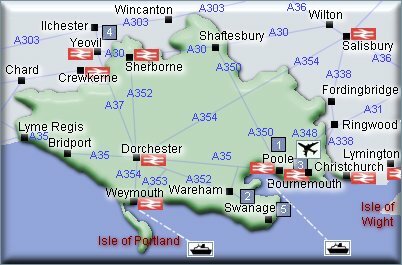 Airport indicated is Bournemouth International. Dorchester is off the A35. Rail Stations (Not all stations shown). Dorchester does have a station. Towns & villages ...Click on initial letter..